For a total of some 1400 km or so, in spite of being right across the bay from each other. So the new route will naturally reduce ferry traffic and the money from that, but for all others involved it will be a good thing. Total distance is about 120 km. A similar distance is the proposed Korea - Japan tunnel from Fukuoka to Busan (or thereabouts), which would of course use Tsushima on the way since there is no need to tunnel undersea when there is a good stretch of island to use on the way. This route has been proposed for as long as I remember, and I remember seeing posters promoting it around Kurume (close to Fukuoka) where I used to live in 2001. This tunnel never really gets the attention it deserves due to bilateral relations and the relatively small size of the cities and areas it would serve. If the two capitals were across the bay a tunnel like this probably would have already been built (maybe around the 2002 World Cup?). 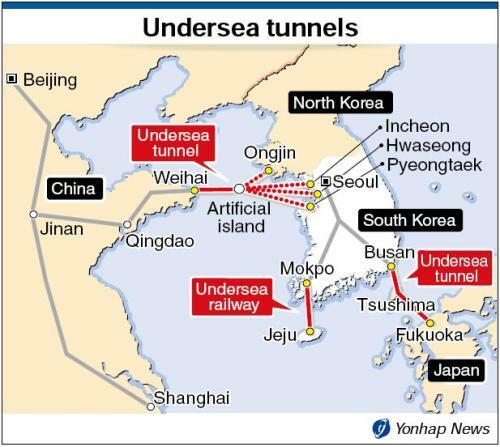 One other proposed tunnel is one from Korea to China, which is a good bit longer but still doable. The one to China would face all the necessary complications including relations with NK, which would view it as a threat. Korea is effectively an island right now, and a tunnel of this sort would join it to the continent. With a tunnel to Japan the explorable land by car or train would be around 4.8 times bigger (I'm not taking islands into consideration), but it would still effectively be cut off from the continent. The Jeju-do one is hard to say, since all the traffic to and from there is by airplane and few would add 4 hours to the trip just to drive there. On the other hand, it only involves a single country which makes it easier, and being able to ship goods without a ship or plane is attractive. So let's hope the Chinese tunnel gets the discussion started again, because it will be built first.